Have any of my readers tried this product? It sounds truly amazing! 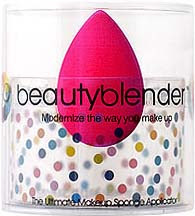 Here's the blurb from the site: "Beautyblender was created without edges in order to eliminate visible lines and streaks. Bounce Beautyblender against your face when applying make up. Bouncing, called stippling in the make up world, blends make up without creating changes in the texture or tone of your skin. Use Beutyblender's pointed side for hard-to-reach spots like around the nose and mouth, and under the eyes. Use the round base for foundation and blush on the larger areas of your face such as your forehead, cheeks and chin." This product sounds really promising. If any of you, my readers, have tried it, did you like it? Did it work as well as promised? Let me know what you thought.